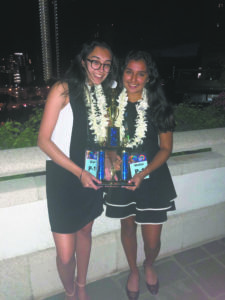 Syosset High School seniors Malini Rudra (right) and Diya Chadda (left) recently took top honors at the Global Student Debate in Honolulu. The debate team co-captains wound up beating an all-boys team from Taiwan in the finals. More than 18 international teams participated in the championship which was sponsored by the Hawaii Tourism Board. The team of Rudra and Chadda were accompanied by Syosset Department coach and Head of Forensics Lydia Essinlinger.